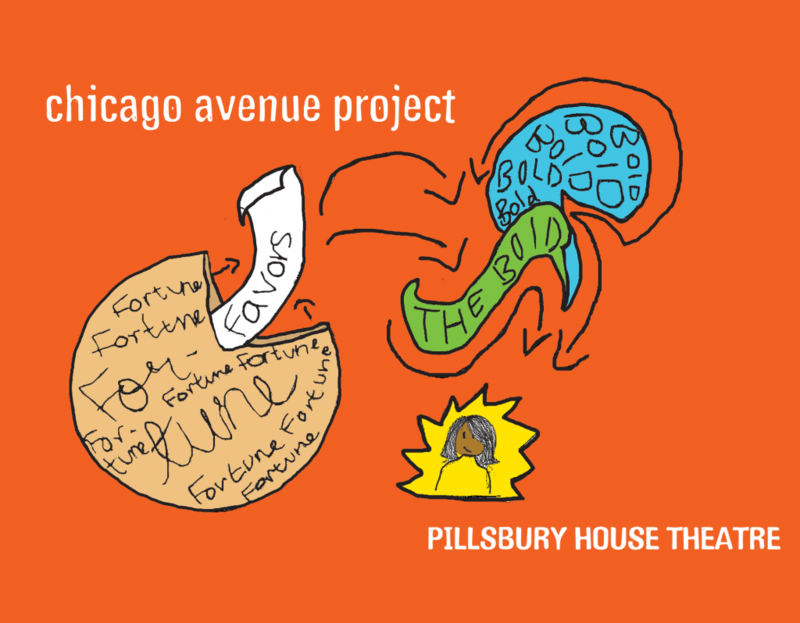 Now in its 23rd year, Pillsbury House Theatre’s award-winning Chicago Avenue Project returns on April 22 and 23, 2019. Fortune Favors the Bold features six original, short plays written and directed by Twin Cities theatre artists, and performed by South Minneapolis youth alongside local professional actors. Theatre artists involved include Aimee K Bryant, Many Voices Fellow Marvin González De León, Pillsbury House Theatre Company Member Paul de Cordova, and more. For each round of the Chicago Avenue Project, a theme is chosen based on a phrase or idiom, which is then incorporated into the script of every play. The theme, “Fortune Favors the Bold,” was selected by the kids. Topics from this spring’s show include a robot uprising, a DJ named Mr. Peep, and a couple of cartoon characters having an existential crisis, to name a few. In addition to the performances, Chicago Avenue Project youth also help to develop the show’s publicity materials and decorate the props. Fortune Favors the Bold will premiere at Pillsbury House Theatre, 3501 Chicago Avenue South, Minneapolis, on Monday, April 22 at 7:00 pm and Monday, April 23 at 4 PM. All performances are free and open to the public. No reservations are necessary. Since 1996, the Chicago Avenue Project brings together the Twin Cities best adult playwrights, actors, and directors who volunteer to work one-on-one with neighborhood youth on the creation and production of an original play. Individual children develop close mentoring relationships with at least three adults who are successful in their creative fields while adult professional artists share the chance to perform in wildly imaginative plays as talking guinea pigs, horses, computer gaming systems, and other indescribably unique characters. The Chicago Avenue Project gives every child—regardless of their circumstances—the opportunity to discover that he or she has a lot of value to offer. The project is not about teaching youth to perform, though they do learn acting, nor is it about teaching them how to write plays, though they learn that as well.